If adding to an existing camera location, you can get a new premade BNC Siamese Cable to run this security camera microphone and use BNC Female to RCA Male connectors to terminate the BNC to RCA to connect the microphone and DVR. 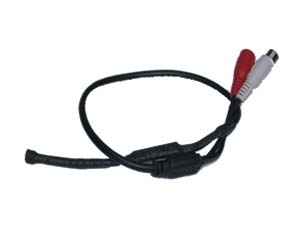 The DC power connectors will simply connect from the cable to the mic, and to a 12V power supply. You can purchase a 12V 500mA power supply here. If you are adding a new camera and microphone, then we suggest purchasing our Audio Video Power CCTV Wire and a DC Power Splitter which together will let you connect a camera and microphone together on one cable and power both at the same time as well. For the power supply in this case, we suggesting using at least a 12V 1amp power supply to make sure ample current is provided to both the camera and microphone.